What Is Name Correction Affidavit? Name Correction Affidavit, as the name suggests, is a document sworn by a person affirming his or her real name as against the wrong spellings or versions of the same name printed erroneously in any document. Such an affidavit may be sworn before either a Notary Public or a Magistrate. A name correction affidavit is the best way to separate the grain from the chaff and to disown the incorrect versions of a name that might have crept in any document by error. It is important to have this affidavit created in case your name has been printed wrongly in any document because it may become difficult to prove that it is the same person being referred to, owing to the different spelling of the name. Any potential employment or educational opportunity may be at risk, if the qualifying documents carry different names/spellings because of the cautious nature adopted by the authorities to prevent impersonation. Who Can Create A Name Correction Affidavit? A Name Correction Affidavit may be created by any person whose certificates or documents have been printed with the wrong spelling or version of his/her name. A name correction affidavit is similar to a ‘One and the same person’ affidavit in many respects, chiefly because both affidavits are created when there are different versions of the name printed in different certificates. However, the difference kicks in when it comes to the validity of different versions of the name. For instance, a name with three words may be expanded fully in one document while one or two of the words may be abbreviated in another document. Observe the following. Sharath S Kumar, Sharath Shantha Kumar and Sharath S K may be declared to be one and the same person using the ‘One and the same person’ affidavit. What is to be observed is that in this case, all three versions of the name are correct since they only differ in expansion. However, if Sharath S Kumar’s name is printed as ‘Sharath S Kumer’ in his certificate, it is more appropriate to choose a ‘name correction affidavit’ instead of ‘One and the same person’ affidavit– though the purpose may be achieved using any of the affidavits. It is to be noted here that in a name correction affidavit, the name may be printed wrongly. Both versions may not be correct unlike in the first example. How to Create A Name Correction Affidavit? A Name Correction Affidavit may be created by declaring the real name of the person as recorded in his/her documents along with the incorrect name and the document in which it has been printed wrongly. What To Include In A Name Correction Affidavit? A name correction affidavit includes identifying details like Name, date of birth, father’s/husband’s name and address. It contains the correct and incorrect spellings/versions of the name and the documents in which the correct and incorrect versions of the name is mentioned. All the details are solemnly affirmed and declared, and sworn that there has been no misrepresentation or fraud in making of the affidavit. The affidavit needs to be printed on a Stamp paper of requisite value according to the respective state’s Stamp Act. It is signed by the deponent and then attested by either a Notary Public or a Magistrate. When a name correction is notified in the Central Gazette, it will be mentioned that the person’s name has been mentioned wrongly in a particular document and it may be amended accordingly. The correct spelling of the name is also mentioned; while in a ‘one and the same person’ affidavit is notified, it is declared that both names are of the same person. In this case, there is no mention of the correct spelling of the name. The next step after creating an affidavit is the publication of newspaper notification. The purpose is to ensure transparency and to prevent fraudulent name changes, for instance, in order to avoid payments to banks etc. 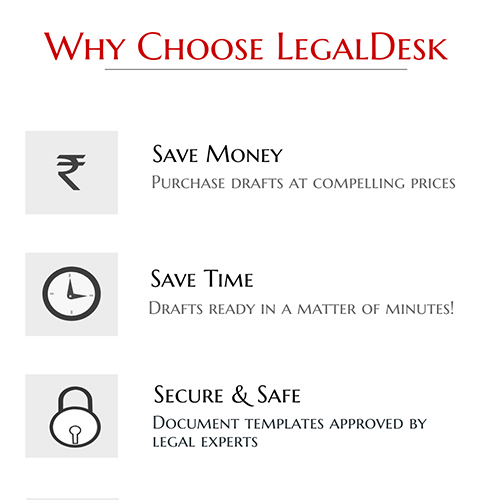 Legaldesk.com can assist you in every step of your name correction. We can help you get your name correction notified right in your city. It is always safe to notify in one national and one local newspaper as stipulated by the passport authorities. Once the affidavit and newspaper ad is in place, it can be considered whether to go for gazette notification or not. It depends upon the individual requirement. While most authorities accept affidavits and newspaper copies for name correction, some insist on gazette notification. UPSC and most banks insist on gazette notification in order to amend their records. Legaldesk’s name change package will help you in changing/correcting your name which also includes gazette notification. Why Wait To Correct Your Name? Do not hesitate to take action if there is any error in your name printed in any document. It has been rightly said that a stitch in time saves nine. So, get an affidavit and newspaper notification if you have not done anything about the misprinted name. If you already have them, proceed with gazette notification, since it would be impossible to predict when the need for the same would arise. Please click on the button below to get your name correction affidavit drafted by us.